Two American citizens from The Gambia were formally charged by federal prosecutors in the United States on Monday for allegedly plotting to overthrow the government of their home country. According to the US Department of Justice, Cherno Njie of Texas and Papa Faal of Minnesota participated together in “an unsuccessful attempted coup against the government of The Gambia” late last year. Prosecutors allege that Njie, 57, plotted with Faal, 46, to overthrow the West African nation’s leadership, and traveled to The Gambia last month in hopes of accomplishing as much with the aid of an arsenal of weapons and an armed group of around 12 individuals. Their efforts were foiled, however, and they returned to the US and were later arrested. “The group’s plan for the coup was purportedly to restore democracy to The Gambia and to improve the lives of its people. They hoped they would be able to take over the country without having to kill any Gambians. They also expected to be join by up to 160 members of the local Gambian military who supposedly agreed to participate in the coup,” Justice Dept. investigators allege in the complaint unsealed this week. The Justice Dept. describes Njie as a Texas businessman by way of The Gambia who was the main financier of the failed coup; according to prosecutors, he and Faal, a dual US/Gambian citizen believed to have also served in the US Air Force and Army, conspired with upwards of a dozen others to take down the Gambian government. “Prior to departing for The Gambia, between August and October 2014, Faal and other co-conspirators purchased multiple firearms, including M4 semi-automatic rifles, and shipped them to The Gambia for use in the coup attempt. Members of the conspiracy also acquired night-vision goggles, body armor, ammunition, black military style uniform pants, boots and other personal equipment,” the DOJ alleges. 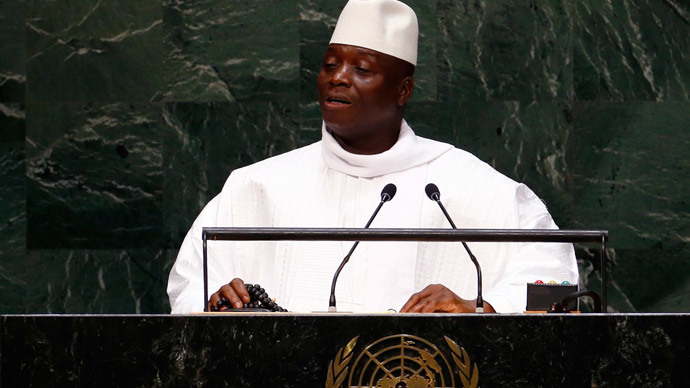 Despite being well equipped, however, prosecutors say that the attempt to overthrow the Gambian government fell flat when one of the co-conspirators, on Dec. 30, fired a shot outside of the State House in Banjul where the Gambian President Yahya Jammehlives and was met with heavy fire. “Although numerous conspirators on the assault teams were killed or injured during the failed attempt to take control of the government building, Faal was able to flee the scene and he ultimately returned to the US., Njie also returned to the US,” Monday’s statement reads in part. Faal entered the US Embassy in Senegal the day after the failed coup, reads a portion of the official complaint, and was interviewed by the FBI both there and at an airport outside of Washington, DC upon his return on January 1.